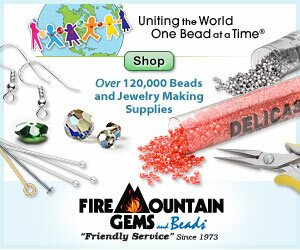 Is there a beader on the planet who can resist a great bead sale? Many of us have stocked up on oodles of delicious beads because the prices were so irresistible. What I like the most about a great bead sale is that I might be persuaded buy something that is outside of my beading comfort zone. It encourages me to use a color, style or technique that I might not have tried otherwise. Before my LBS closed down, I always went straight to the discontinued clearance bin before shopping for the beads I had come for. 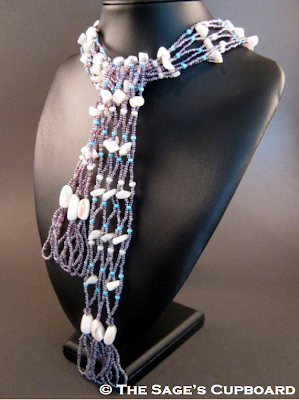 I have made many interesting pieces using the beads I discovered there. Wherever there’s a deal on beads, inspiration is sure to follow. Another excellent place to shop for inexpensive beads is yard sales. Now that the weather is warming up, people will be clearing out their garages and cupboards, and it’s a great time to hunt for ex-beaders who want to give you their bead stash at to-die-for prices. Old jewelry that can be up-cycled is also something to watch for. Hopefully, all busy beaders have received their tax returns by now, because we’re going to need it to take advantage of the famous Dollar Days sale at Artbeads.com. The selection is, in a word, tempting. It’s a great opportunity to try something new without spending a lot. I’m looking forward to testing out some Swarovski buttons. Dollar Days is on until April 28th. Happy shopping! One of the worst things about growing up is that you have to buy your own chocolate come holidays like Easter. The infamous bunny didn't visit me this year, and I have a serious craving for jelly beans! To ease my longing for treat baskets and colored eggs, I decided I would bead something to capture some of the festive elements of the spring holiday. 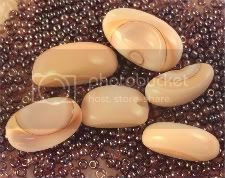 I started with some egg-shaped Luhuanus shell beads, which have a lovely pastel pink shade. They were a birthday gift, and I have been waiting for just the right project to use them in. Both the shape and color are perfect for an Easter project. To really tie the shell beads in with the Easter beadwork, I decided to create a necklace that had elements of spring, as well as the ocean. Ideally, the finished piece would be something to wear while combing the beach on the first warm day of April. For the beach element, I selected some pearl-colored white Ceylon 6o’s, and mother of pearl chips. I hand selected each chip for size and shape, using only those that were not too flat or sharp edged. Of the three strands of chips in my stash, only a small fraction of them were ‘just right’. On the spring side, I chose lavender iris mix seed beads - a very Easter egg-like color - and 8o’s in a robin’s egg blue. The lavender beads are one of my favorite shades, and I have been hoarding them for a long time. Often I wonder if that reluctance to use beads is counter-productive, but eventually the perfect inspiration comes along and it’s time to let the beads go. I had no reservations about scooping up these beads and getting to work. To really let my favorite beads shine, I wanted to do something big and bold. I decided to create a scarf with widely spaced netting. It has a really nice weight to it, and drapes without sliding as lighter lariats tend to do. The Luhuanus shells didn’t make it into the necklace until the very end. Early on I decided not to let them get lost in the beadwork, and reserved them for the fringe. Deciding on the fringe created yet another dilemma. Coral fringe would have fit in with the shells, but I wanted to mimic the look of a knitted scarf. The simplicity of the looped fringe really compliments the shells, as well as the netting. I really underestimated the amount of beads it would take to create so much netting. Between the beadwork, and the culled beads, I have nearly depleted my entire stash of lavender seed beads. For a while I almost considered stopping after the first few rows of netting, but it was obvious that more layers were needed. Fortunately, it was totally worth it. I’m so pleased with how the piece turned out, I plan to make another very soon. 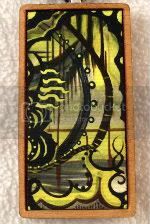 My latest inspiration was this canvas on wood pendant from Artbeads.com. I’m crazy about the intense yellow-green and black design, which reminds me of a tropical island on a foggy morning. Or perhaps it’s a jungle during a midday thunderstorm. But it could also be an underwater garden. I’m not sure what artist Charlie Clingman had in mind when he created his original painting, but the “Springling Yellow” pendant makes me think of both vegetation and water. It has a very West coast kind of vibe to it. I considered using a contrasting palette for the beadwork, but in the end I decided to keep things low-key and compliment the pendant’s colors instead. 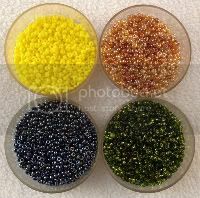 I selected gunmetal, copper lined green, lemon yellow and brown AB mix seed beads for this project. I puzzled and pondered for a long time about how to use the pendant. I didn’t want to overpower it with heavy beadweaving or too much color. While looking through my bead stash, I spotted some black gemstone chips and was inspired to use them in the necklace base. I drew from the tropical island theme to create a vine to suspend “Springling Yellow” from. 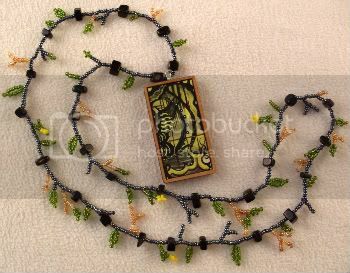 After stringing the chips with gunmetal seed beads and the pendant, I added the green, yellow and brown beads with randomly spaced and sized leaves, branches and picot flowers. I am still pondering the idea of adding more fringe and thickening the necklace chain, but as beaders know, sometimes it’s best not to fiddle and fuss too much over our work. We risk going too far when we try to fix what isn’t broken. There are so many things around us to inspire colorful and interesting beadwork, but sometimes the beads themselves are all we need to create eye-catching designs. This brightly colored spiral rope necklace was born when I stacked my seed bead trays in the wrong order one day. The bright blue beads were directly above the orange beads, and I was blown away by how well they contrasted. The combination reminded me of color trends in plastics several years ago. Every beach bag, juice jug and table cloth on sale came in green, blue or orange. Immediately I pulled out my bead trays and put together a palette to use in a spiral rope. Unfortunately, I was already working on two projects, and my latest inspiration would have to wait. I decided to take the color combination I had created and put a pin in it. Literally. 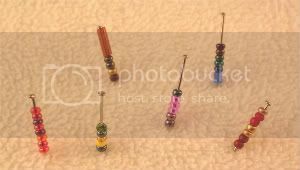 When experimenting with colors, or planning variations for future beading projects, a great way to remember palettes is to string a few beads on a sewing pin and stick it to a pin cushion for later. 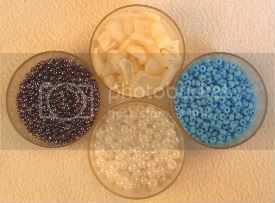 Rather than just setting aside a bag or bowl of beads, you can use this method to set color ratios, too. 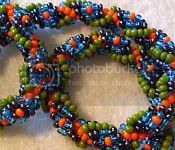 You can remind yourself to use more of that dark green and less of the pale green, or to alternate between your primary colors and black or white, by stringing on beads in the right proportions. 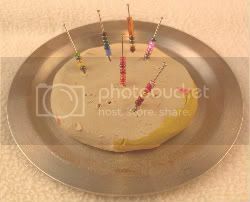 I didn’t have an extra pincushion lying around, so I put a glob of soft modeling clay from the craft cupboard onto a dish and used it to hold my bead pins. Whenever I think of an interesting color combination, I pin it up to provide ideas when I’m stumped for what to create next.